"Update: He's been told he's a good boy." 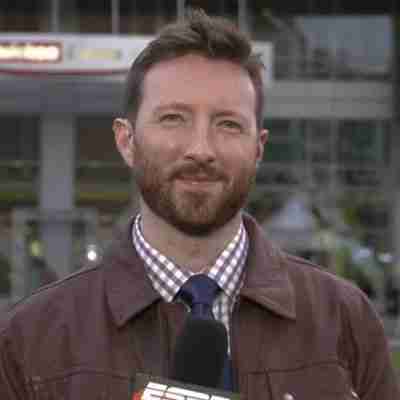 Dave McMenamin is best known for his work as a sports reporter, covering the NBA for ESPN. But now he is gaining a new kind of notoriety for the lifesaving actions he himself performed off the court. And the story couldn't be sweeter. McMenamin was in Texas this week to report on Tuesday's basketball game between the San Antonio Spurs and Cleveland Cavaliers. While driving near the arena before the tipoff, however, he spotted something far more important. A scruffy stray dog was running loose in the road — and McMenamin dropped everything to help. After getting the pup into his car, he wrote a Tweet asking for advice on where to take him. The response to McMenamin's tweet was overwhelming — but he didn't stop there. For those telling me to keep him: I’d love to. But I’m on the road 150 days a year for work. I cannot own a dog. Despite having been in a life-and-death situation just minutes earlier, the dog McMenamin had saved seemed to understand that he was now in good hands. McMenamin, likewise, was quickly smitten with the pup. Following the advice of one of his followers, McMenamin and his new dog friend were soon on their way to a nearby animal shelter. McMenamin and Buddy shared a tender moment before heading into the shelter. Fortunately, once inside the shelter, Buddy was found to have been microchipped — making it possible to find his rightful owners. Of course, he might never have survived had McMenamin not acted when he did. By now, the two were friends, so saying goodbye wasn't easy. After the adventure with Buddy came to an end, McMenamin's Twitter feed resumed its focus on the sports coverage expected from a basketball reporter. But McMenamin obviously hadn't forgotten about that dear little dog. On Wednesday, he gave yet another update to let everyone know that the dog's owners had been found. UPDATE! Animal Care Services was able to get in touch with Buddy’s owner today. She is scheduled to pick up her pup tomorrow for the reunion. I asked ACS to pass on my info to her so I could provide some sort of postscript in the future. Good news, indeed. McMenamin's actions have been roundly praised online, where hundreds followed along with his rescue of the dog, and it's easy to understand why. While it may have been much easier for him to simply look the other way upon seeing a creature in need, McMenamin decided to act out of kindness — and kindness to animals is always worth celebrating.